In classrooms across the country, teachers are spending less time teaching proper penmanship. Now recognizing that it’s an essential skill, educators are looking for ways to reverse the trend. Lipten got her graduate degree in education 10 years ago from the Bank Street College of Education, also in New York City, with a major in reading and literacy. But she admits, “They don’t teach you handwriting. It’s one of those things you have to figure out on your own.” And so she did, using tactics she picked up from occupational therapists who help children learn to grip a pencil correctly and form letters legibly. Lipten’s experience is not unfamiliar in today’s classrooms. When 220 randomly selected first-, second-, and third-grader teachers from across America were asked, “Do you feel prepared to teach handwriting?” an overwhelming number – nearly 90% – answered no, reports Steve Graham, a professor of special education at the University of Maryland in College Park, who conducted the survey last year and has been studying children’s handwriting and its instruction for more than 20 years. What does teachers’ lack of training mean for our children? A lack of instruction in our classrooms, where formal handwriting time has decreased in the past 30 years and often peters out by the end of third grade, according to Graham. A generation ago, the traditional recommendation for penmanship was 75 minutes of class time a week, and children practiced the skill through daily drills. But with the emergence of the whole-language movement, education shifted from drill-and-skill to looser activities and invented spelling, resulting in little formal spelling and handwriting instruction in the classroom. Children typically begin writing in print, or manuscript, in kindergarten or first grade and move on to cursive writing, or script, in second and third. But now that kids are attempting to write at a younger age – many preschoolers show an interest in writing and most know how to write their name – formalized instruction is necessary to correct bad habits. There is evidence that it’s hard to change an incorrect grip, according to Graham, and with academic tasks being given at a younger age, children devise their own ways of forming a letter. “If a child doesn’t receive instruction, he may improvise, starting letters at random places or going from bottom to top or right to left,” says Jan Olsen, an occupational therapist and creator of Handwriting Without Tears, a curriculum program for teachers. Some parents show little concern over their children’s penmanship, believing that computer use in schools and at home ultimately makes it irrelevant. Experts disagree: “Handwriting is still an important part of language development and a component of the overall approach to literacy,” says Barbara Willer, deputy executive director of the National Association for the Education of Young Children in Washington D.C.
Instruction in printing letters by hand helps children focus on the same kinds of visual information they use to differentiate one letter from another when they read, explains Eileen Perlman, a learning specialist and White Plains, NY-based co-author of Preventing Academic Failure. And when children are comfortable forming letters correctly, they are better equipped to process letters automatically during reading and writing, freeing them to focus on the meaning of the words. This skill affects children’s performance in every academic subject, including science and math. The goal of handwriting instruction, say experts, is to give children enough practice in writing letters that it becomes automatic. “You want to make the skill of handwriting so easy that a child doesn’t have to concentrate on how to make or where to put the letter but instead can focus on what she wants to say,” explains Perlman. 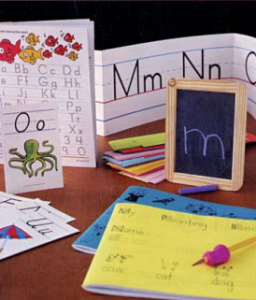 If a child needs to pause and pay attention to letter formation during a spelling test, for example, she may be thinking about where to start the e or a and not about how to spell the word. This takes her away, cognitively, from the task at hand and puts her back to the mechanics. The quality of a child’s handwriting can also sway a teacher’s assessment, warns Graham. Throughout elementary school, and sometimes beyond, handwriting is how a teacher evaluates a student’s work. Studies show that when grading papers and tests, teachers who are asked to judge purely on content and not on presentation still give lower grades to work that is written less neatly. And if a child can’t write legibly enough to read her own her, it can also affect her success in subjects like math. Although there is no evidence that handwriting problems interfere with mathematical processes, “if a child has difficulty spacing numbers in columns, it can cause unnecessary errors in working out a problem,” says Graham. Realizing that kids are not getting the instruction they need, a growing number of teachers are looking for ways to help themselves help their students. “The pendulum is swinging back,” says Perlman. “As standardized tests require more written expression, people are seeing the impact of the lack of this skill.” Five years ago, Jan Olsen offered 18 Handwriting Without Tears workshops a year for teachers, occupational therapists, and school districts. Currently, Olsen and her staff run 90 workshops a year for teachers and OTs and another 150 for districts nationwide, “A good handwriting teacher gives a child a tool for success in every subject,” she says. There are three levels of instruction when teaching a letter, Olsen explains. First, the teacher says the letter, demonstrates how to form it, and asks the child to imitate the motion. Once the child is able to do this, he can be given a written model to copy with no demonstration from the teacher. The final stage is for the child to have no demonstration or model but simply to write the letter from a verbal cue. For example, when the child hears, “Write an E,” he’ll be able to picture the letter in his mind, and his hand will make the movement on the paper. Now that elementary and even nursery school classrooms routinely include computers, the question of writing verses keyboarding inevitably comes up – but experts agree that handwriting should not be abandoned, for all the developmental reasons described earlier. “The keyboard is a wonderful tool, but it’s not a substitute for a manual form of expression,” says Beverly Wolf, director of the Hamlin Robinson School in Seattle, a K-8 school for children with dyslexia and related language difficulties, and co-author of a chapter on handwriting in Multisensory Teaching of Basic Language Skills. As many as 10% of students suffer from dysgraphia, a neurological disorder that produces extreme difficulties with handwriting. Direct instruction with an occupational therapist is recommended to overcome the problem, which may be related to fine-motor, visual, or spatial abilities. Since most schools do not offer services to children whose only difficulty is handwriting, it may be up to parents to find an OT or learning specialist and to supplement the expert’s work by helping children at home. A school or pediatrician can usually provide contacts. 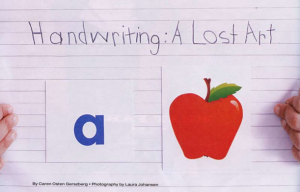 When a child has difficulty with handwriting, the problem is usually related to fine-motor development or visual or spatial difficulties, says Eileen Perlman, a learning specialist in White Plains, NY, and co-author of Preventing Academic Failure. Children with symptoms of weak muscle development may have trouble pressing their pencil on the paper; their letters tend to be light and look shaky. If a child has difficulty directing the pencil or knowing which way to turn her hand, the problem may be caused by visual motor difficulty. And if the letters are too close together, very far apart, or not placed on the lines of the paper, this may be related to a spatial problem. The proper way to grip a pencil, says Perlman, is to hold it about one inch from the point. The child should pinch the pencil between the thumb and index finger and rest it on the middle finger. Molded-rubber pencil grips, which are widely sold at stationary stores, can be helpful for establishing a proper grip. Kids should be reminded to use their non-writing hand to stabilize the paper. Parents can help ward off handwriting problems by providing kids with what Perlman calls “old-fashioned playthings: paper, pencils, crayons, paints, clay, blocks, craft supplies – things that don’t run on batteries and let children use their fingers to manipulate something.” The always controversial subject of video games made headlines in May when a University of Rochester study reported that playing action video games sharply improves visual attention skills. But Perlman says the assumption that manipulating a video controller translates into better hand-eye coordination in young children is not true. Creating a home writing center can also be helpful. Stock it with stationary, journals, to-do lists, forms to fill out, pencils, markers, crayons, and chalk. For a tip sheet on helping your child improve his handwriting, go to the site of American Occupational Therapy Association at www.aota.org. 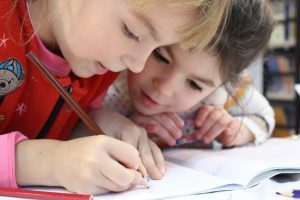 Find resources that can help children with handwriting and other academic issues from Eileen Perlman’s Preventing Academic Failure site, www.pafprogram.com. For more about dysgraphia, visit the National Center for Learning Disabilities at www.ncld.org or the Learning Disabilities Association of America at www.ldanatl.org. Get information about molded-rubber pencil grips and other products that can help improve your child’s handwriting at www.thepencilgrip.com.